This post also contains affiliate links and I will be compensated if you make a purchase after clicking on my links. 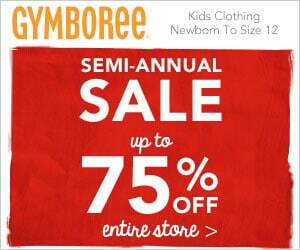 Semi-Annual Sale: Up to 75% Off Entire Store at Gymboree. Shop now before the sale ends 1/10. This is such a great time to shop! I saw puffer vests as low as $14.99, shirts for $7 and more! Stock up for what you need. You can’t beat this sale. It’s my favorite time to shop each year for the kids.